In Pennsylvania, it has been illegal to grow hemp for over 80 years due to the plant’s close relationship with marijuana. Hemp, however, is non-psychoactive, containing virtually no THC. Additionally, hemp is a promising cash and cover crop for organic farmers. In 2014, when the federal Farm Bill relaxed restrictions and allowed certain farmers and institutions to grow hemp for research purposes, Rodale Institute was one of 16 organizations to receive a permit. Over the course of four years, we are conducting two simultaneous trials: a variety trial and a weed competition trial. The first tests which strain of hemp performs the best year over year. The second examines whether integrating hemp into a crop rotation as both cover and cash crop will help deter weed growth. 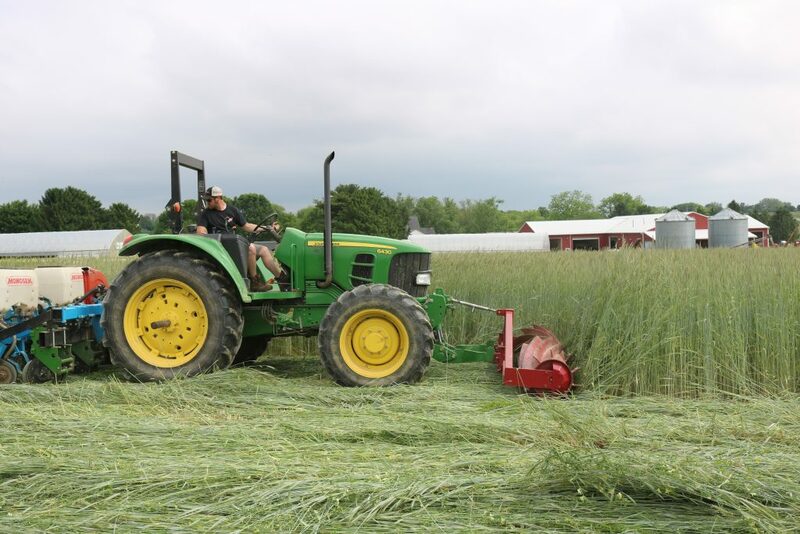 Now in its second year, Rodale Institute’s hemp research will help to formulate plans for farmers to eventually integrate industrial hemp into their own organic operations. Recently, both trials were planted for the 2018 growing season. In the variety trial, three types of hemp were planted: Anka, Santhica, and Canda. After harvest, Rodale Institute will plant vetch as a cover crop in those fields to replenish nitrogen used by the hemp crop and suppress weeds in advance of next year’s planting. In the weed competition trial, we are researching hemp’s effectiveness as part of a diverse crop rotation over the course of four years. The rotation includes hemp, wheat, corn, soy, vetch, rye, oat clover, and sorghum sudan grass. Some plots are managed with tillage and others with no-till for comparison. Half of the soybeans in this year’s weed suppression trial were planted using the no-till roller crimper. The roller crimper simultaneously crimped and killed our 2017 fall cover crop of rye (leaving behind a thick mat that will suppress weeds) and planted soybeans through the cover. The rye was at the right age for rolling, laden with pollen but not yet gone to seed. 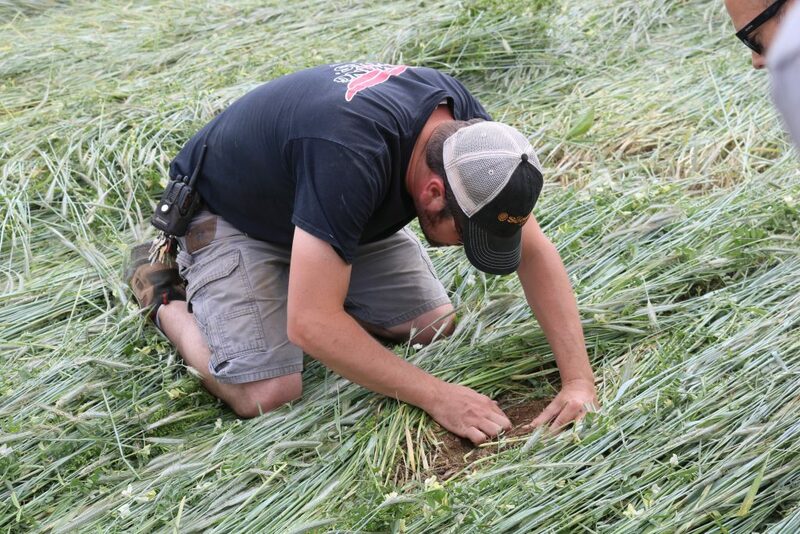 The roller crimper pushes the rye over and breaks the stem every 7 inches to ensure it has been killed. As the rye decomposes, it feeds the soil while shading out weeds. The soybeans then sprout through the covering without competition. This allows cash crops to thrive in organic operations. Next year, hemp and wheat will be planted where this year we planted soybeans and we will evaluate the effectiveness of each. Industrial hemp is a fascinating crop!